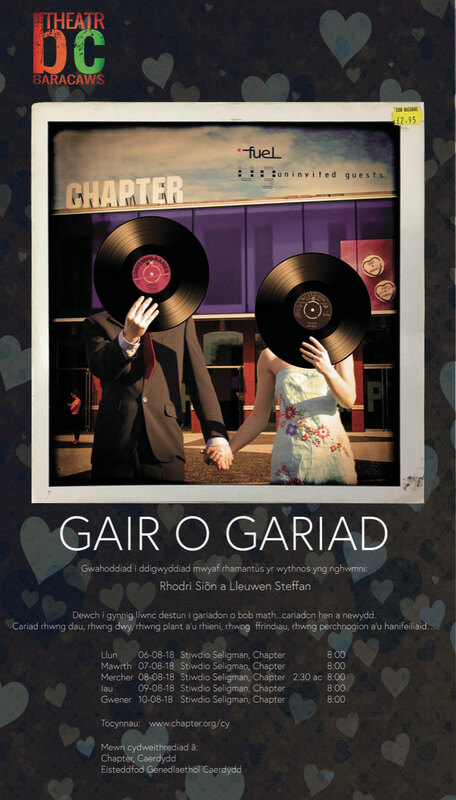 Gair o Gariad is a unique theatrical experience. Your hosts, Lleuwen and Rhodri, will welcome you with a glass of sparkling wine or water, and then, through music, their love story unfolds. This event is somewhere between a wedding reception, a wake and a radio dedication show, and what makes it especially exciting is that most of the show is created following dedications sent in beforehand by audiences. The dedications vary greatly in tone, and can be to anyone — husband, wife, partner, lover, friend, parents, grandparents, animals etc etc — you may be celebrating a birthday or an anniversary — let us know! You don’t have to ask for a dedication if you want to see the show but following feedback from previous performances people were sorry they hadn’t! So, if you want to join us on this happy occasion, please send a dedication to someone you love to…………….. Tell us what they mean to you and why you’ve chosen this piece of music, and your messages may become part of the show. Only 40 tickets available for each performance. This is a Welsh language production, but the production is highly visual and an English précis will be available. …Well, this is the best song in the world, so I’m dedicating it to myself!